Organic turkey only 99 cents a pound Lyn said with glee. We had just cooked a 17 pounder for our annual trip to DC to see Misy, Mark, Maria and Clara B. This year it was topped off with Mike joining us for the ride both ways. So off the Wholefoods we went to get groceries after returning return to an empty frig. We return with a 17 pounder. 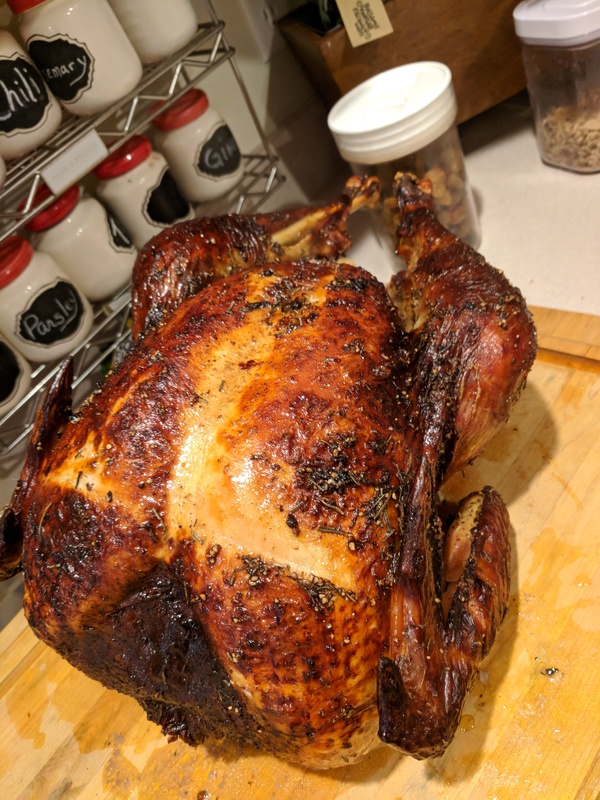 Into some buttermilk brine over night and finally we got to try the perfect turkey button on our stove. Always said we would do it but never had. 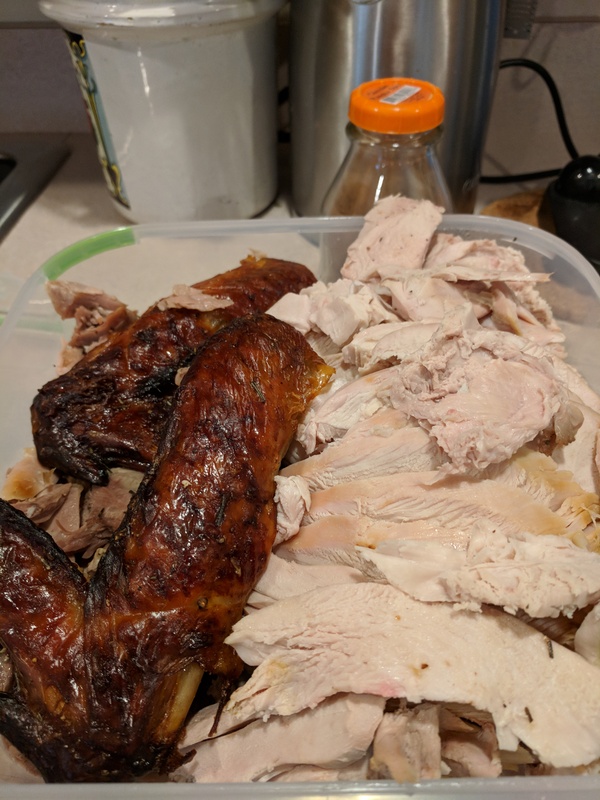 So I melted some butter added rosemary and live oil, let thicken slightly and then basted over the turkey which I had stuffed with oranges, lemon, garlic and onions. Placed the prob in the thickest part of the thigh and plugged it I. Pressed the perfect turkey button then the prob button and closed the oven. I basted a few times and at one point losely covered with tin foil to avoid burning. We went off to run a few errands and returned just as the oven had turn itself to keep warm. That meant it was done, perfect according to the oven genie. Left it sit and then carved, make room in the freezer her comes some turkey. Whipped up a quick gravy for tonight . I made some bone broth with the carcus will freeze some for later. My tasting du4ing the carving agreed it was perfectly cooked and the skin was super crunchy and hit the spot. 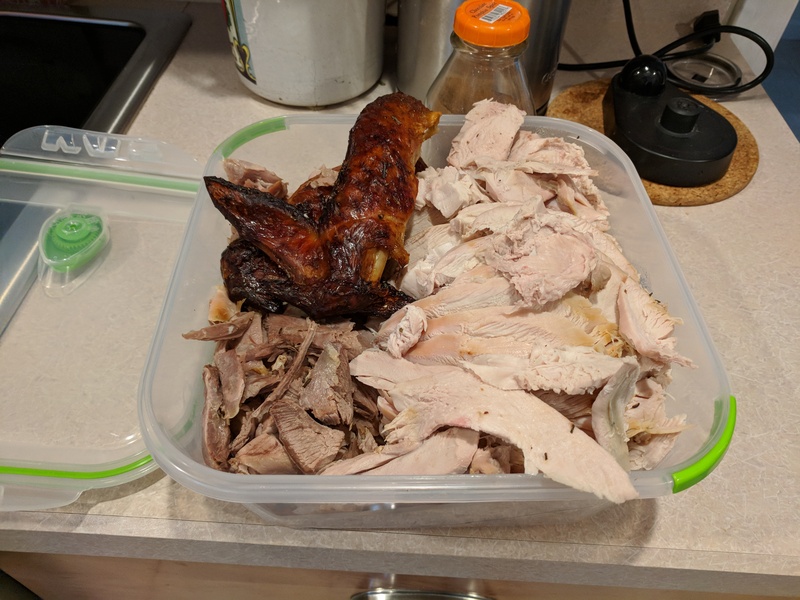 This entry was posted in Meat. Bookmark the permalink. ← Lyn just forwarded this link to me and I happen I have an bunch of left over chicken which I was going to make soup but this sounds interesting.